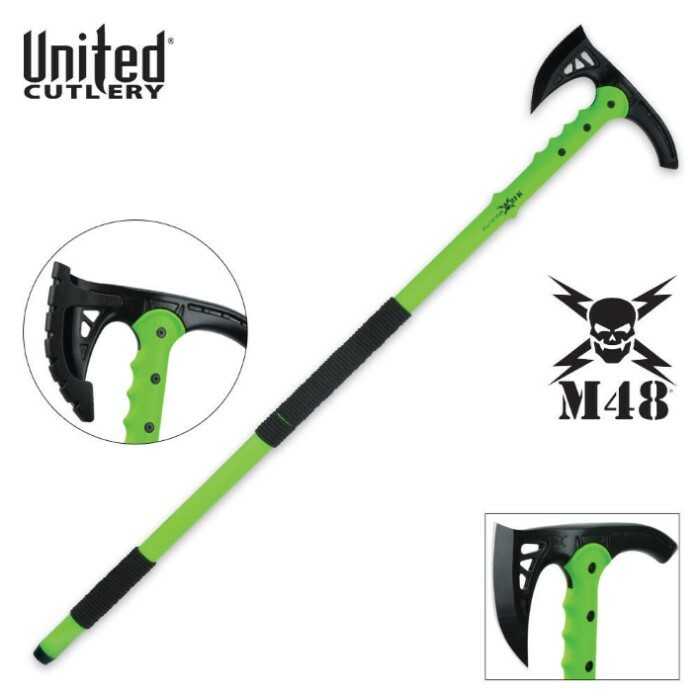 M48 Apocalypse Undead Survival Tactical Walking Axe | BUDK.com - Knives & Swords At The Lowest Prices! The M48 Apocalypse Axe is the perfect companion for hiking and camping. With a 37" overall length, it's great as a walking staff while camping. A cast 2Cr13 stainless steel blade is razor-sharp and can chop through saplings with ease. A 30% fiberglass handle is nearly indestructible and the axe head is attached to it with three separate metal bolts. You'll be ready to take on an unlimited amount of Zombies with this tool in your hands! This axe works great until your in freezing temps. That's when it tends to break. I wanted the walking hammer. I thought I ordered the walking hammer. When I received the walking axe instead I was a little upset, until I took the axe out of the box and realized it is awesome (and sharp!). I like it so much I still ordered the hammer. Some days you feel like slashing and some days you feel like bashing. The axe is a fantastic piece. Great for camping! the only thing wrong with this ax is that the bolts come lose after extensive use. so i have to tighten them back. I use this outstanding tool as a walking security device. The Apocalypse Walking AX is outstanding. It helps you keep a steady pace and it gives you exceptional personal security while walking. If you enjoy walking ---YOU MUST GET ONE OF THESE IMMEDIATELY FROM BUDK!